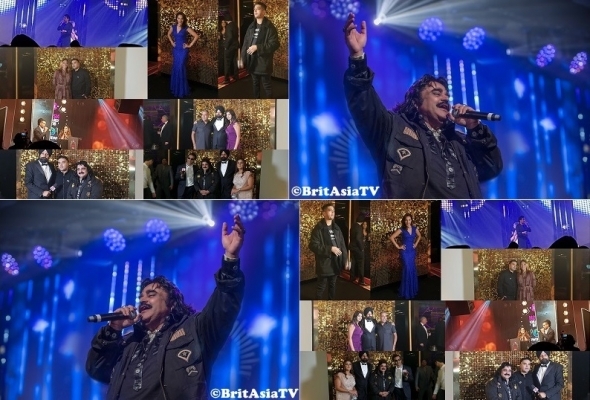 A TRULY rousing finale, some great live performances and a chance to celebrate and spotlight the success of Asian music globally were just a trio of the outstanding features of the BritAsia TV Music Awards. There was also some unscripted banter which memorably stirred the audience – comedian Sania Mirza described Birmingham, her own home town (and that of hosts BritAsia TV) as a not very appealing place… and got it back in kind from some of the audience! And Bollywood singer Mika Singh having a touch of the verbals when host Preeya Kalidas thought his performance had come to an end, but he wanted to continue (and did) introduce the other people on stage and from his entourage. But the abiding and strongest memory will be singer Arif Lohar stealing the show at the very end and proving unquestionably that music at its very best has no limits or boundaries and there is only one language of excellence! Receiving the Lifetime Achievement Award, Lohar broke into song and got the crowd up off their feet and dancing. It was a wonderful end to a grand evening which saw some of the world’s most popular Asian singers lauded. Among the other performers on the evening were Raghav, the RnB star from Canada, who announced his comeback in stirring fashion, treating the audience to his latest single, ‘Maayera’ and a fast medley of his chart hits – ‘So Confused’, ‘Can’t Get Enough’ and ‘It Can’t Be Right’ which are all hit UK top 10 tracks. Bollywood vocalist Mika Singh treated the audience to his unique talent and spontaneously duetted with the other host, Apache Indian. Some of the biggest stars on the Punjabi music scene were not only winners on the evening but performed too. G Sidhu from the US was one of these and there was also a show-stopping set from Nimrat Khaira. Also in attendance on the evening was Naughty Boy, Steel Banglez, Panjabi MC, ITV sports presenter, Seema Jaswal, BBC presenters, Sunny and Shay, and top business leaders including Avnish Goyal and wife Anita. Both Steel Banglez and Panjabi MC received awards on the evening (see list below). Tony Shergill, CEO of BritAsia TV, said: “This moment of celebration belongs to all British Asians and everyone involved in this industry. “The BritAsia TV Music Awards 2018 have been a brilliant success bringing together stars from all over the world. The awards were held at Westminster Park Plaza, Westminster Bridge on Saturday, October 6. BritAsia TV is the UK’s only TV platform for British Asians and is committed to representing and highlighting the achievements of the British Asian community. The music entertainment channel has offered a platform for established and upcoming talent. BritAsia TV is available on Sky (824), Virgin (840) and Freeview via Vision TV (264). ‘The True Cost’ – killing for fast fashion? UK Asian Film Festival (Tongues on Fire) and The Circle host powerful screening….